When you select a glove, you have to select a size. Computer mice are a bit like gloves. Too small or too large and they will not work as intended. Using a mouse that is not right-sized could lead to discomfort or even pain from repetitive stress injuries (RSI). Computer mice, in fact, are one of the leading causes of RSI. 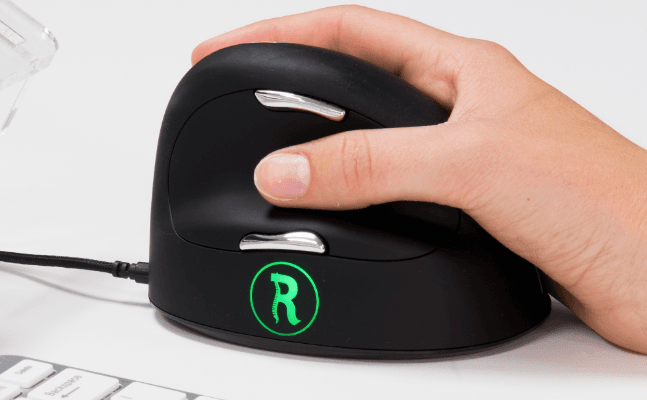 The R-Go Break HE Ergonomic Mouse with Anti-RSI software from R-Go Tools is a vertical mouse that comes in two sizes: 1) for right-handed people with hand sizes between 6.5″ and 7’7″ (165-195mm) and 2) for right-handed people with hand sizes larger than 7.7″ (195mm) . As of this writing, the model tested (R-Go Break) is available only in a right-handed USB wired version. They offer six other mice that are exactly identical to this model tested except they don’t have the Anti-RSI software or the RSI indicat0r light. These other models include wired, wireless, left-handed, and right-handed versions (in other words, a mouse for everyone). 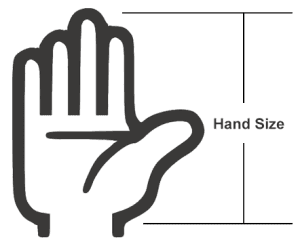 The way R-Go Tools measures hand size is from the tip of the middle finger to the start of the wrist, like the image to the right. My hand measures 8.5″ using this scale. I tested the larger mouse and used it with Macs, Chromebooks, a Linux laptop, and PCs. Spoiler alert. This is a fantastic mouse design! As a long time user of trackpads, I’m considering keeping this mouse to use as my daily driver! Over the years, mice have caused more pain than trackpads for me. I’ll post another review if I end up using this mouse long term. By the way, this is the first mouse I’ve tested from a company based in the Netherlands. The mouse is designed in the Netherlands and manufactured in China. Let’s jump right away into what makes this mouse unique. 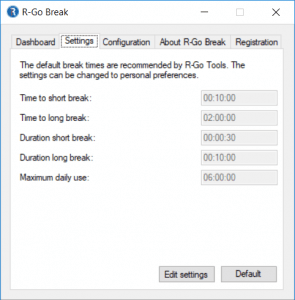 Windows users can download free Anti-RSI software that allows the user to set durations for short and long breaks and maximum daily use. The mouse then tracks usage and shows a green light when you are good to use the mouse. The indicator light turns orange when you should take a break. And then the mouse turns red if you have skipped your break. There is a dashboard that tracks your usage over time. While this may seem like a small feature, you can’t manage what you can’t measure. This software allows you to measure usage and breaks and thus give you the info you need to mouse around within your limits. As a side note, I am not an expert in how long you should break and at what intervals. I just kept the software at the default settings. See below for an example of the RSI lights. It takes some getting used to as I don’t normally look at my mouse. But the indicator light is noticeable enough and you’ll catch yourself seeing the orange and even red lights from time to time, and hopefully less and less of the red light. If you are a Mac user or did not install the Anti-RSI software, then the light indicates the dots per inch (DPI) resolution setting. You can click on the DPI button and set the resolution to 500, 1000, 1800, or a blistering 2500 and the color changes to indicate your selected DPI. I run a large 4K external display so appreciate the 2500 setting. At this setting, I can easily travel around one of the highest resolution screens with minimum hand movements. There is no memory on the mouse so if you unplug your mouse you will need to reset your DPI again. Fortunately, that button is right on the mouse and easy to change. 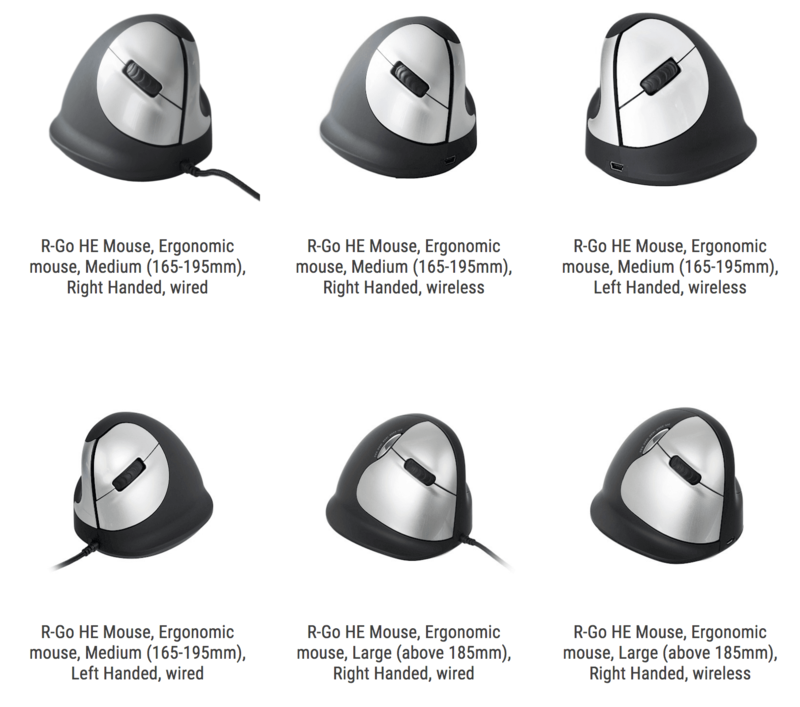 R-Go Tools also make six other identical mice that don’t have the Anti-RSI software option and the associated RSI status light. These mice are otherwise identical in every other way. The other models include right-handed, left-handed, wired and wireless options in two different sizes. Definitely a mouse for everyone. This is a vertically oriented mouse. With vertical mice, you need to get a right-handed or left-handed model. Using the wrong hand model will simply not work. This mouse has five buttons and one DPI setting button. Windows, Linux, and Chromebook users get the full functionality of all of the buttons. These buttons are pretty self-explanatory. The forward and back buttons are mainly for Web browsers to cycle between pages you have visited in one tab. The left and right click are the standard mouse clicks. The scroll wheel allows you to move up and down the currently active page. For Windows users, you can also click the scroll wheel for added functionality. The DPI resolution setting allows you to cycle through the four options as described above. For Mac users, the forward and backward buttons don’t do anything. These are the buttons that allow you to go back and forward within a window, usually a Web browser. The scroll wheel button also doesn’t work on Macs. I am mostly a Mac users. While these buttons that don’t function are convenient, they are not critical. We tested this mouse across of a bunch of laptops and had no issues. Windows users have the added functions of the Anti-RSI software and three extra buttons (back, forward, and mouse wheel click as noted above). We tested the mouse on a MacBook Air and MacBook Pro and had no issues. We tested the mouse on Asus and Lenovo Chromebooks with no issues. We tested the mouse on an Ubuntu laptop with no issues. We also tested on a Microsoft Surface Pro with no issues. This mouse works well across all systems. Unless you have an ancient computer like my old school favorite the TI-99/4A, this mouse is going to work with whatever computer you use. This mouse is comfortable. I’ve now used it exclusively for a couple of months. The mouse looks slightly larger than I would expect and now I understand why. The larger size fits my hand better and the resulting comfort has helped me for the most part not think about the mouse. I’ve mainly used trackpads for the multiple finger gesture shortcuts. While I can’t swipe a bunch of fingers on this mouse, I don’t miss the trackpad as much as I thought I would. I also forgot how much better clicking and dragging while editing in Photoshop is using a mouse over a trackpad. Nothing’s perfect but this mouse is comfortable enough where I and leaning towards full time use with this model. I am not sure if most people are going to be stoked to measure their hands and weave through all of the options to select the best version of a mouse. While this may be out of the ordinary for most people purchasing a mouse, I can clearly see the advantages of getting a properly sized mouse. Give it a try! Getting a right-sized mouse may make the difference in your search for the most ergonomic mouse. This USB wired model tested is only for right-handed people and the Anti-RSI software is only for Windows users. Right-handed Windows users represent the majority of the market right now so most people should be able to use the mouse that I tested. Left-handed people or folks needing a wireless version have options here. R-Go Tools also makes six other versions that are identical in features except it doesn’t come with the Anti-RSI software. If you are a Mac user, I would recommend getting the version without the Anti-RSI software as those models cost less and you won’t miss any of the ergonomic features. The Anti-RSI software is fantastic! You can’t manage what you can’t measure and this software measures your mouse use and tracks recommended breaks and break durations…all the time. I wish this software also ran on Macs and Chromebooks. I imagine as demand for their products grows, development for other platforms will happen. 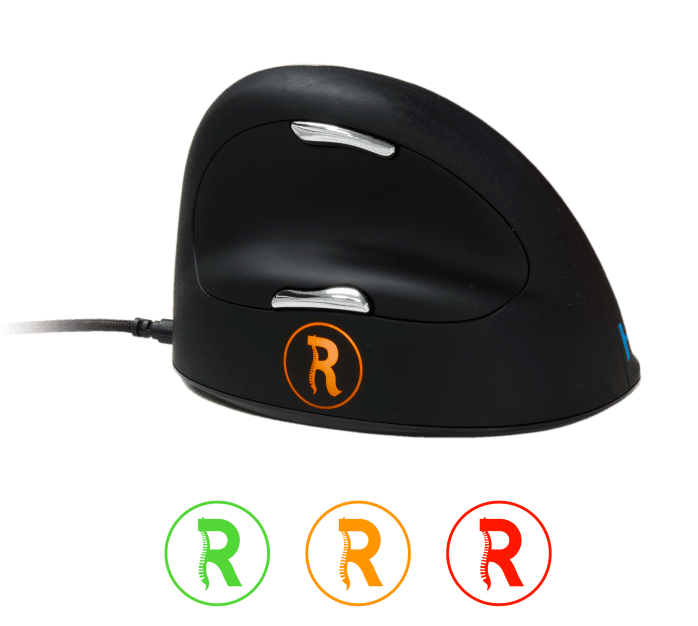 This mouse, at least for Windows users, comes with a full-time personalized mouse referee who is going to call timeouts when needed. We tested this mouse on Windows, Macs, Linux, and Chromebooks. Windows users get three extra buttons for added functionality: back, forward, and mouse wheel click. These extra buttons are great for surfing the web faster. For other users, you’ll need to use the right click and then select forward or back in the pop-up menu to achieve a mouse-driven back or forward navigation. Initial quality of this mouse is excellent and I expect that it will last a long time of daily use. Overall this is a mouse I would recommend to anyone to use as their daily mouse. It is one of the best mice we have tested and comes with unique features that are designed to keep your hands as free from repetitive stress disorder as possible. If you care about the health of your hands, this mouse will serve you well for years.